A constellation can be a combination of many different types of stars, each with a different story, and sometimes a spot in a constellation isn't even a star. Take Orion for example ("lovely camera image" below courtesy NASA). That red spot in the lower left, Orion's upper-right shoulder, is a red giant (near the end of it's lifespan), that may have consumed or spun-off planets that once harbored civilizations. 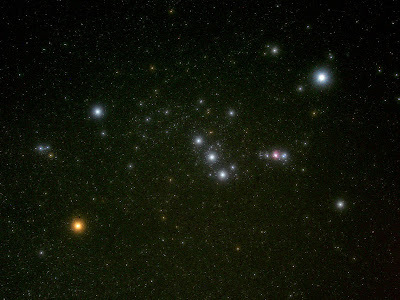 In the upper right (Orion's lower left foot) is supergiant Rigel, at the prime of life, possibly shining light on a thriving civilization at its peak. Now check out the red spot in Orion's belt. It's not a star, but "the stellar nursery known as the Great Nebula of Orion."